Recently, we looked at the pros and cons of implementing Dynamics 365 in the cloud if you’re rolling out Dynamics in your business for the first time. But what about when you’re upgrading your Dynamics solution? What kind of challenges might you face when switching from a legacy Dynamics software to a new, cloud-based app? Users of cloud-ready Dynamics apps such as CRM Online or NAV 2018 have the option to upgrade at renewal, but if you’re an on-premise user, you’ll need to decide whether the time is right for you to make the change. If you’ve decided to migrate from an older, on-premise version of Dynamics — such as Dynamics AX or Dynamics CRM — to Dynamics 365, you probably have a few questions about what the process actually entails, and how much it’ll set you back. Let’s take a look at the costs, practicalities, and options involved when migrating to Dynamics 365. There are a few options when it comes to the technical move to Dynamics 365. Which one you choose will depend on how much of your existing solution you want to take with you, and how old that solution actually is. It’s important to note that you can only upgrade to Dynamics 365 from the most recent version of your current software; you can’t skip over versions and hop straight to the cloud. For example, if you’re a Dynamics CRM user and you want to upgrade to one, or a full plan, of Dynamics 365’s CRM apps, you need to be running the most recent version of Dynamics CRM to bridge over to Dynamics 365. So, if you’re currently using Dynamics CRM 2011, you’ll need to update your software to the CRM 2013 version, then 2013 SP1, then 2015, and finally to 2016, before you can make the final jump to Dynamics 365. So, if you’re running a recent version of Dynamics, you can take the “upgrade” route to Dynamics 365, where your data and customizations will be converted into their new cloud-based environment. The versions that can be directly upgraded from are relatively new, with relatively few users compared to versions that have been around longer. Coupled with the fact that businesses using newer versions are less likely to be motivated to upgrade to Dynamics 365, the number of organizations utilizing the upgrade method is probably fairly low. Most potential switchers are likely to go down the second road: re-implementation. If you have a particularly dated version of Dynamics, or if your business processes have changed since your original implementation, you might want to start afresh with a new solution. This option constitutes more of a re-implementation than an upgrade, as the portions of data and content you want to keep will be removed from your existing solution, and migrated to Dynamics 365. Whichever technical route you take to your new solution, there are two choices when it comes to licensing it. Dynamics 365 is a subscription-only service, paid on a per user, per month basis. This will likely be a different method of licensing to what most legacy Dynamics customers are currently subject to. Keep up their Software Assurance or Enhancement plan, and purchase cloud add-on SKUs which will give them access to Dynamics 365. This can be done at any time. Switch to subscription-only SKUs at their anniversary or renewal date, at which point, the Software Assurance or Enhancement plan will end. Cloud add-ons allow users to switch to a cloud-based model even if they’re already subscribed to an on-premise Dynamics software plan, and want to move to the cloud as soon as possible. With the cloud add-ons option, users purchase a sort of “top up” license for a low cost, which allows them to use Dynamics 365 in the cloud while maintaining their existing software plan. They can then drop their current plan when their renewal date arrives, and use their cloud SKUs going forward. Cloud add-ons can be purchased at any time, meaning users don’t have to wait for their renewal date to roll around before they can access Dynamics 365. The other option is to obtain “from SA” transition licenses, and move all users to Dynamics 365 in one fell swoop, dropping any existing Software Agreement or Enhancement Plans in the process. This option is only available when an SA or Enhancement Plan customer’s perpetual license plan reaches its renewal date, and is paid up in full. This option is also offered to Subscription customers with at least three years of investment under their belts. How long does an upgrade to Dynamics 365 take? Unfortunately, this is one of those “how long is a piece of string” questions. How long the migration will take depends entirely on what version you’re moving from, how many users you have, and how much of your old solution you want to take with you in terms of data, reports, and customizations. On average, a fairly “vanilla” out-of-the-box instance of Dynamics, with minimal customizations and few reports to migrate, might only take around 8-12 weeks to upgrade. A version with more extensive customizations that require development to incorporate into Dynamics 365 will take longer, possibly around 12-24 weeks. For users who are looking to their new Dynamics 365 solution to overhaul their business processes completely, the undertaking could last up to 9 months. Can I migrate my customizations when I upgrade? Again, whether or not you can take your customizations with you when you switch, and whether or not they’ll need to redevelop to work in the Dynamics 365 environment, will depend heavily on which version you’re currently running. The foundation of many of the Dynamics family’s legacy apps has changed significantly over time, so some older customizations may either be incompatible with Dynamics 365 in their current form, or rendered unnecessary by its new native features. If you do have a lot of customizations, you should first perform an audit to see whether you’ll actually need to port them over to the new solution. You might find that the expanded functionality in Dynamics 365 negates the need for some customizations; Dynamics 365 does a lot of things and connects to a lot of other services natively that older versions do not. However, if there are still some gaps that need to be filled by customizations, they may need to be redeveloped to make sure they work correctly in their new environment. Taking stock of your needs and the type of functionality you require from your re-tooled customizations before you start your migration will help your consultant design the right solution. The older your existing solution is, the more likely it will be that you’ll need to throw out, or rebuild your customizations when you move to Dynamics 365. If you’re running a more recent version, such as Dynamics AX 2012 R3, Microsoft provides a tool to help upgrade your code ready for deployment in the new environment. The tool allows users to scrub up custom code and bring it in line with Dynamics 365’s requirements. It’s worth noting, however, that Dynamics 365 uses a different customization paradigm for customizations, which extends the solution, rather than layering new code over the top, so the custom code will still need a little manual tweaking to make it fully compliant before it goes live. What about my existing reports? You can probably guess what the answer to this question is going to be by now; it depends. Similarly to the subject of customizations, how viable it is to move reports to Dynamics 365 will depend on how old your existing solution is. The tools and data structure of Dynamics software has been updated over time, so some older versions’ reports will not be compatible with Dynamics 365, and will have to be rebuilt on the new platform. With so many new intelligence tools available to Dynamics 365 users however, starting over and creating new, more relevant and more useful reports might be a good idea, and worth the initial outlay of time and effort to construct. More-recent versions of Dynamics may be able to transfer SSRS reports using the custom code upgrade tool mentioned above. Can I move back to on-premise if the cloud doesn’t suit my business? Yes. Now that Dynamics 365 is available on-premise, users can return to an offline deployment if they need to. So if for whatever reason you decide that a cloud deployment of Dynamics 365 is not working out for you, you can switch back to on-premise. Microsoft has a program in place to facilitate moves of this nature, known as Software Assurance Reattach. Customers wishing to return to on-premise through the SAR program must be subscribed to an Enterprise Agreement with Software Assurance, or Dynamics Price List with Enhancement, who have fully transitioned to the cloud. How much does it cost to migrate to Dynamics 365? 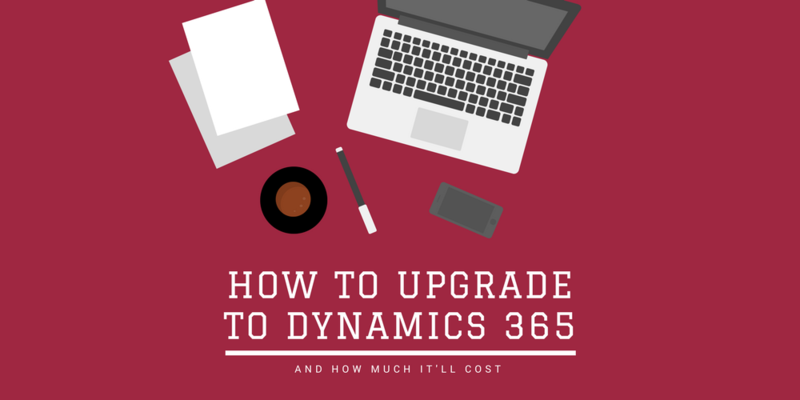 Of course, there are some costs associated with upgrading to Dynamics 365, but for (relatively) early adopters, there’s a good deal to be had that’ll significantly cut down the expense involved. Microsoft is offering upgrade incentives until 2019 to encourage on-premise users to switch. Customers who use Dynamics CRM, AX, GP, NAV, or SL, and are currently enrolled in a Software Assurance or Enhancement Plan, may be eligible for a 40% discount on Dynamics 365 license prices when they switch from on-premise Dynamics software. This includes any new, additional licenses purchased before the November 1 2019 cut-off date, as well as all licenses purchased as replacements to the old Dynamics software seats. To work out how much you’ll save on Dynamics 365 licensing cost under the discount scheme, use our licensing calculator. Simply input the number of user licenses you require in the appropriate column. After November 1 2019, Dynamics customers will still be able to upgrade to Dynamics 365 at a discount, but the offer will be reduced to 15%. That’s the software pricing; you’ll also need to consider the costs of actually making the switch. Though upgrading to a more recent version of your current software might not sound as complicated as implementing a whole new solution, it can still be challenging to bridge the gap between an on-premise legacy software and a new, cloud-based model, and get everything up and running quickly without leaving any valuable data behind. You’ll likely already have worked with a partner on your initial implementation, or have used a partner to develop or customize your Dynamics solution, and it’s worth engaging an expert in this case to make sure your migration goes smoothly. Partnering with a Microsoft Cloud Service Provider or a qualified Dynamics consultant on your upgrade is highly advisable for all Dynamics users, but if you’re a NAV user who wants to upgrade to Dynamics 365 Business Central, it’s essential. To get your hands on Business Central, you’ll need to go through a CSP partner, as Business Central is not available to purchase directly from Microsoft. Costs to update your solution will vary depending on what version you’re currently working with, how many users you have, and the amount of data and content that you want to port over to your new solution. Many CSPs offer upgrade services for a fixed price, which makes it a little easier to cost out your migration. These fixed price packages often start at around $7,000. As you’re moving away from in-house servers and into cloud-based storage, you’ll also need to factor in the cost of any additional cloud storage you may need. The good news, however, is that while there will be a few new features and processes to get to grips with, users of legacy Dynamics models will be able to get to grips with Dynamics 365 without much in the way of additional training. User interfaces have been updated, but for those already familiar with Dynamics software, the learning curve won’t be particularly steep. Plus, by moving to the cloud, you’ll also save on infrastructure and server maintenance costs in the long run. How can I prepare for an upgrade to Dynamics 365? To ensure your switch is as successful as possible, you should be prepared to do a little planning ahead of the move. Dynamics 365 offers a massive range of tools, and provides businesses with myriad opportunities to optimize their processes, but every organization has individual needs; working out what those needs exactly are before you go live with your new software will help you hit the ground running, and enable your consultant to deliver a Dynamics 365 that best fits your organization. How much data do you need to import? Are there any customizations you need to transfer over? Is the functionality enabled by these customizations already supported by Dynamics 365? Are there any third-party apps or services you need to integrate with? Are these supported by Dynamics 365 natively, or will they require customization? How many users do you have now? How many will be needed in the new solution, and at what levels? How much storage will you need? Will you need to purchase extra space? Moving from an on-premise version of Dynamics to Dynamics 365 is both a software upgrade and, technically, a migration. You’re switching your deployment method, moving from a locally hosted program to a solution based in the cloud, so you’ll need to port your data out of your legacy system, and move it to the cloud environment where Dynamics 365 will be run from. You’ll save yourself a lot of time (and therefore a lot of money) if you scrub up your legacy data before you haul it all into a new solution. 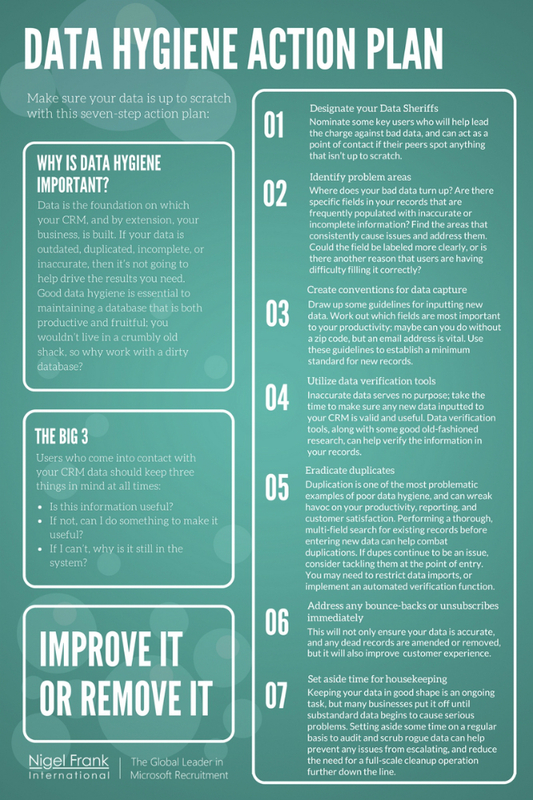 For advice on how to prepare for data migration, check out our handy tip sheet. Need help getting the most out of your Dynamics 365 solution? 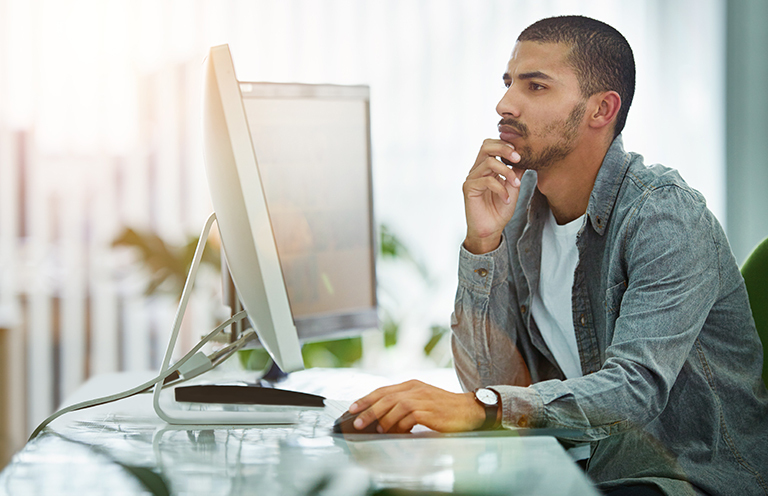 Browse our free database of qualified Dynamics professionals, and find your next consultant, administrator, or developer today.